• CLICK HERE for Part 1. Here’s my question: How many times do the Carolina Panthers have to prove that they’re for real before people start believing? The Vegas line is one indicator, but just in reading Twitter, doing radio appearances, and listening to assorted forms of media throughout the week, there’s a definite perception that the Panthers need to win this game to legitimize their status as a serious contender to win the Super Bowl this year. As if going 12-4 weren’t enough! This is now, by my count, Carolina’s fifth game in which the national onus has been on the Panthers to exhibit some sort of legitimacy against a playoff-caliber opponent. You know what? The Panthers won three of their first four “prove it” games. They beat these very 49ers in San Francisco, 10-9, in one of the most brutally physical games of 2013. The next week, they went home and beat the Patriots on Monday Night Football, 24-20, by coming up with that infamous stop on Rob Gronkowski. They would get blown out by the Saints in New Orleans in Week 14, 31-13, but came back two weeks later in a monsoon to pull out a 17-13 victory over the Saints, staking their claim to the second seed in the NFC in the process. A win over Atlanta in Week 17 confirmed their placement. Ironically, the last team that had to really go through this national wringer was Carolina’s upcoming opponent. Few were skeptical of that dominant 49ers defense when they came out of the Mike Singletary era and went 13-3 in 2011, but even with Jim Harbaugh at the helm, perhaps even fewer believed that Alex Smith and that offense could keep up with the elite teams they would see in the playoffs, even after big victories over the Giants and Steelers during the second half of the season. The 49ers were 3.5-point underdogs when they lined up at home against the Saints in the divisional round, but after winning one of the greatest games in NFL playoff history, 36-32, people took the Niners seriously.1 A couple of Kyle Williams fumbles kept them from the Super Bowl that year, but the Niners would make the big game a year later. And like those 49ers, I don’t think whoever is out there doubting the Panthers believes that their defense isn’t for real. Most of the doubt, as it has been all season, is being projected onto Cam Newton. And I don’t really know what else Newton can do to overcome that. Normally, this conversation revolves around a young quarterback who hasn’t come up with a big drive to win a game, but Newton led a 13-play, 83-yard drive in the fourth quarter to come up with the game-winning touchdown against the Patriots, and then followed that up with a five-play, 65-yard drive with less than a minute to go to beat the Saints in Week 16. Does he smile too much? Would it help if he made fake frowny faces to prove how committed he is? It’s as simple as looking at the scoring offense and defense ranks. Carolina’s offense scored the fifth-most points during Cam’s rookie season, then fell off to 18th last year, finishing in the same spot in 2013. In points allowed, the defense finished 27th in 2011, 18th a year ago, and second in the league this year. Who do you think took the step forward to push this team into the playoffs this year? That story — defense takes an enormous leap forward while offense stays the same — is harder to parse out than the more traditional story of a quarterback suddenly getting great before dragging the rest of the team to the playoffs. That the Panthers were instead sprung by their defense isn’t and shouldn’t be an indictment of Newton. He has been and continues to be an above-average quarterback, albeit one with an uncommon set of skills. His weapons, Steve Smith and DeAngelo Williams aside, are a bunch of castoffs. Newton was already good enough for the Panthers to win. The rest of the team has just caught up. That also includes a good amount of regression past the mean, of course. Ron Rivera was a staggering 2-14 in one-touchdown games after the Week 2 loss to the Bills, at which point he flipped a switch and suddenly became Analytical Ron, destroyer of worlds. The 10-9 win over the 49ers was Carolina’s first victory in a one-touchdown game this year and its first close win over a .500-or-better team during Rivera’s run as head coach; it promptly won its next four one-touchdown games to finish 5-0 in one-score contests. And in that win over the 49ers, ironically enough, it was TYFNC pinup Jim Harbaugh who took the conservative track and ended up losing because of it; Harbaugh kicked a field goal with a 6-0 lead on fourth-and-a-foot from the 2-yard line late in the second quarter to go up 9-0, only for the Panthers to score a touchdown before halftime to make it a 9-7 contest. The 49ers never sniffed the end zone again, while Carolina would miss a field goal before Graham Gano hit from 53 yards out to give the Panthers their one-point margin of victory. 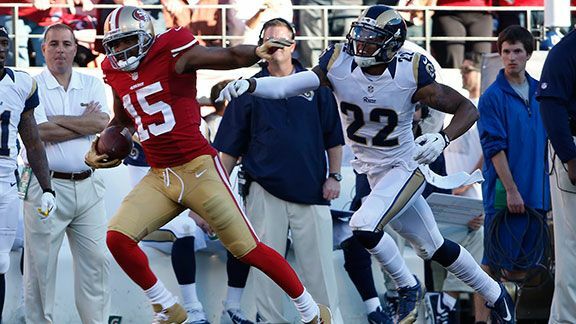 There are reasons to think the 49ers will be better throwing the ball in this rematch. For one, they lost Vernon Davis before halftime to a concussion (on a play when he probably fumbled), with replacement Vance McDonald dropping a perfect 35-yard pass up the seam from Kaepernick later in the contest. That’s not to suggest that Davis has never dropped a pass, but you have to figure he might have done a better job on the play than McDonald. The other reason, of course, is that Kaepernick didn’t have his favorite receiver. The availability of that guy — and the possible absence of Cam’s favorite weapon — might be enough to swing Sunday’s game to the 49ers. Michael Crabtree made his return to 49ers practice five days before that loss to the Panthers, but he wasn’t in the necessary game shape to suit up for another couple of weeks. He returned against the Rams in Week 13, and while it’s tempting to tie San Francisco’s 6-0 record since then to Crabtree’s presence on the offensive side of the football, the truth is that his comeback has been in fits and starts. Crabtree was relatively quiet for three weeks before breaking out with a 100-yard game against the dismal Atlanta pass defense in Week 16, only to finish up with a three-catch, 29-yard day against Arizona’s elite pass defense in Week 17. The always-opinionated Bruce Arians commented before that game that Crabtree wasn’t the same guy, and given how comfortably Patrick Peterson shut him down, you had to wonder whether Crabtree would be an impact performer in the playoffs. And then Crabtree caught four passes for 70 yards on the first drive of the win over the Packers last Sunday, including a 31-yard catch on fourth down that saw Crabtree run straight through two distracted Packers defenders before making a difficult catch thrown to the wrong side of his body in 20-below weather. He finished with eight catches for 125 yards in the win, racking up six first downs while also drawing a defensive holding penalty. What’s even more notable than those statistics is that Crabtree drew 13 targets. That tells you how frequently he was getting open for possible throws from Kaepernick and/or how confident the 49ers were that he could come up with receptions when they needed some. Crabtree didn’t quite play a full complement of snaps, but he did play on 66 percent of San Francisco’s offensive plays, which is a promising figure given the weather and the frequency with which the Niners went with two tight ends and/or a fullback. Against the Panthers the first time out, Kaepernick was both hurried for time and desperate for a receiver to get open. Mario Manningham was active then and started across from Anquan Boldin, which left the Panthers with a pretty obvious coverage plan. 5-foot-8 cornerback Captain Munnerlyn was an obvious matchup for the smaller, speedier Manningham, while 6-foot-1 rookie Melvin White, a 205-pound undrafted free agent out of Louisiana-Lafayette, was a logical choice for the more physical Boldin. That plan basically worked to perfection, as Boldin and Manningham combined for six catches and just 53 yards on 11 targets. Munnerlyn dropped a dead-to-rights interception on San Francisco’s opening drive, which was the only 49ers drive of the day that traveled farther than 20 yards. And after Davis went out with his concussion just before halftime,4 Kaepernick went just 5-of-13 for 48 yards the rest of the way. Crabtree’s presence in the lineup at the expense of the now-injured Manningham provides the 49ers with a potentially lethal advantage. For one, the Panthers will now be presented with a physical mismatch on every snap featuring Boldin and Crabtree on the field at the same time. Munnerlyn is a game corner who has had an impressive season, but he’s giving up about five inches and 35 pounds to both Boldin and Crabtree. You can’t teach size, and the 49ers have it. That’s going to matter against a heavy Carolina pass rush, since Kaepernick is often going to have a tight window to throw and the difference between a completion and an incompletion might very well be how effective the 49ers are at getting off the line of scrimmage. Every football game is full of sub-battles and self-contained skirmishes, and the game-long fight between the underappreciated Carolina cornerbacks and the renowned San Francisco wideouts is going to be one of the more important matchups of the day. While Crabtree’s performance a week ago seemed to indicate that he was back, Arians is no dummy; Crabtree might very well go missing again this week, just as he did against Arizona in Week 17. He certainly represents the biggest X factor for the 49ers in this game. Steve Smith, meanwhile, might not be around to extract his revenge for Ric Flair’s dastardly heel turn.5 Smith sprained his PCL during the Week 16 win over the Saints and missed most of that contest before sitting out against the Falcons in Week 17. He had a setback with the knee during practice this week and publicly admitted as much, which is never a good sign for a player’s availability. Would a missing Smith represent a catastrophic absence for Carolina’s offense? I’d certainly feel better as a Panthers fan with Smith in the lineup than I would with him injured on the sideline, but Smith hasn’t exactly been a superstar for Carolina this season. Even before the injury, his numbers were way down from the work he did during Newton’s first two seasons in the league. In 2011-12, Smith averaged 80.3 receiving yards per game; this year, that figure fell all the way down to 49.7 yards per contest. Smith was still a weapon on third down, as his 17 conversions on third down were seven more than anybody else had on the Panthers, but where he really fell off was in terms of big plays. Smith’s longest catch of the year went for just 44 yards, and after averaging 16.9 yards per catch over the previous two seasons, Smith fell to 11.6 yards per catch this season. That’s a telling drop: It’s pretty clear Smith lost a step this season. He was able to get by on veteran guile and the passing lanes created by the Carolina running game, but Smith’s not the no. 1 receiver he used to be anymore. Heck, he didn’t even lead the Panthers in receptions or receiving yards; Greg Olsen took the title for both those categories. At the same time, though, you could see in that 49ers game that Newton looked to Smith in key situations. The Panthers actually fumbled twice on their final meaningful series before punting, but they took key time off the clock by converting a pair of third downs, finishing up with a quick out to Smith for a first down on what amounted to Newton’s most important pass of the day. Smith might not be the same player he was a couple of years ago, but he might still mean as much to the Panthers as he did then. Passing. Both these teams have solid running games, even if they’re not necessarily always dominant. They each have excellent defenses; Carolina ranked third in defensive DVOA this year, and while the 49ers finished 13th, the return of Aldon Smith turned them into a scarier unit as the season went along, and Smith had one of his best games of the year against Green Bay last week. They each have above-average special teams, with San Francisco trading superior performances from their kickers and punters for inferior return work by their return men. The big question mark, then, is whether either of these teams will be able to throw the football. San Francisco’s passing game was functionally useless in Week 10, and a few key conversions in the second half were enough for Carolina to come through with an enormous victory. The Niners suit up for this contest as the dreaded West Coast team playing a 1:05 p.m. ET game, but if they can get last week’s Crabtree onto the field and keep Steve Smith off it, the difference in each team’s passing attack might be enough to swing the pendulum toward San Francisco. The Chargers won that game against the Broncos in December by seven points, but the 27-20 final score really undersold how well the Chargers played and how far the Broncos were from victory. Denver had a 77 percent chance of victory 12 minutes into the game, but after that, its win expectancy steadily fell with just minor corrections back in its favor along the way. The Chargers had a 73 percent shot at winning around halftime, were up in the 90s in the third quarter, and never fell below 85 percent in the fourth quarter. Denver took over after a questionable San Diego punt down seven points with 5:50 to go and lasted just two plays before Peyton Manning threw an interception that basically sealed the game. I’m always hesitant to look back at a game and pick an arbitrary turning point, but it’s pretty clear this game swung on a series of San Diego stops in the middle of the contest. Denver produced typical Broncos drives on its two first-quarter possessions, with its 16 plays totaling 122 yards while leading to 10 points. It got the ball back with the game tied and 9:46 to go in the second quarter and … froze in its tracks. The Broncos would get just five possessions total during the second and third quarters, and those four drives netted a combined 13 yards and one first down. The Chargers won this game by virtue of those four stops. So what did they do to stop the Broncos? As the king of unsatisfying answers, allow me to tell you that the Chargers turned around that game with a combination of things; there is no smoking gun that tells us they figured out one of the best offenses in league history. For four drives, things went their way. Manny Ramirez whiffed on a block that blew up a run play. A miscommunication on a protection scheme saw Zane Beadles pull right on a pass play and Corey Liuget create a Manning scramble that led to a sack. The Chargers batted down two of Manning’s eight passes at the line of scrimmage. Three of the passes were catchable balls that ranged from borderline drops to straight-up drops. One of the passes was a long duck down the sideline that probably should have been picked off. The Broncos spent most of that time in their typical 11 personnel grouping (one running back, one tight end) and the Chargers responded with two down linemen as part of their nickel package. On one third down, San Diego actually lined up without a single defender’s knuckles in the dirt. John Pagano threw a couple of tricky stunts at Manning, but at this point, I’m guessing Peyton has seen it all. 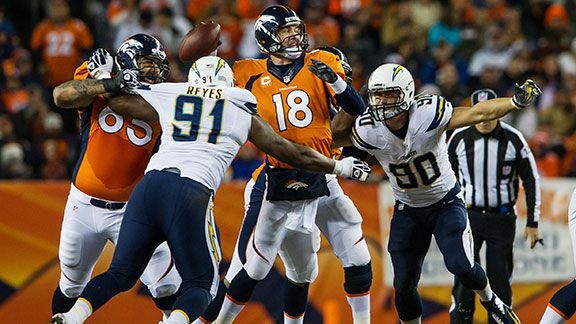 It was a good performance from the Chargers and a bad set of showings from the Broncos. What compounded those poor possessions, though, is that the Broncos got only four chances across two quarters to try to score. Sometimes, the best defense can be a good offense, and the Chargers did an incredible job of keeping Manning & Co. off the field by producing long, successful drives when their offense was between the hashmarks. To contrast, after each of those four failed possessions for the Broncos, the Chargers ran four meaningful possessions6 that produced a three-and-out, two touchdowns, and a bizarre eight-minute, 44-yard ode to chaos in football that included a neutral zone infraction on a punt, extending the possession, and a successful challenge for 12 men on the field. Those drives accounted for 30 plays, 173 yards, 14 points, and more than 16 minutes of possession. The spell wore off — Manning was 8-of-9 for 86 yards on Denver’s next drive, which brought it within a touchdown — but that stretch was enough to put San Diego sufficiently far enough in the lead to win. San Diego’s defense wasn’t good throughout the entirety of the game, but it did enough to give its offense a chance to win. Given that the Chargers have the league’s third-best offense per DVOA, that’s not a bad plan. For most of the season, though, that was too much for the Chargers. San Diego’s recent success has, in fact, been almost directly driven by a sudden improvement in its defense. It would have been hard for the defense to get much worse. Almost impossible, actually. As Aaron Schatz noted on Twitter, the Chargers had a 25.2 percent defensive DVOA between Week 1 and Week 12. To put that in context, Football Outsiders has run DVOA figures for every defense between 1989 and 2013. No defense in football over that 25-year span has posted a defensive DVOA worse than that 25.2 percent figure. The Chargers were not merely bad; they might have been the worst defense since the Cold War. From that point forward, though, the Chargers have been much, much better. From Week 13 (their loss to the Bengals on December 1) through Week 17, the Chargers posted a minus-0.3 percent DVOA, which is almost exactly a league-average performance. And then they were the league’s third-best defense during the opening round of the playoffs, trailing only the Saints and Packers. That’s a pretty ridiculous turnaround, huh? What made the Chargers turn around? For one, their personnel improved. Cornerback Derek Cox, who started the first 11 games of the year and served mostly as a lighthouse beckoning opposing teams to the end zone, was benched for the third time in four weeks during the 41-38 win over the Chiefs in Week 12 and taken off defensive duties afterward. He has played just nine defensive snaps since, while replacement Richard Marshall has at least offered an ambulatory defender in his stead at corner. The Chargers also got back two key outside linebackers in Week 14, as veteran Jarret Johnson returned after missing five of the previous seven games with hamstring and hand injuries, while 2012 first-rounder Melvin Ingram came off the Physically Unable to Perform List just seven months after tearing his ACL in practice. Johnson has helped shore up a leaky run defense, and while Ingram hasn’t been a dominant pass-rusher since returning, he’s managed to become part of the rotation at linebacker and made his presence known last week, when he became one of the millions who have intercepted Andy Dalton in the playoffs. Speaking of that pass rush, it’s really quite impressive to think about what defensive coordinator John Pagano has done with the few players San Diego had with any sort of history of taking down quarterbacks. Ingram was expected to be the team’s primary pass-rusher after accruing just one sack as a rookie, but he tore his ACL in May. The Chargers then signed Dwight Freeney, but Freeney played only four games before tearing a tendon in his quad. Instead, the Chargers have had a pass rush by committee, with no player producing more than Liuget’s 5.5 sacks. You would assume that the Chargers’ pass rush got better right when they got those outside linebackers back and that DVOA surge occurred … and you would be incorrect. San Diego sacked opposing quarterbacks on just less than 7 percent of their dropbacks from Week 1 through Week 12, which was the 15th-best rate in the league. From Week 13 on, their sack rate dropped by half, and only the Texans and Ravens took down opposing passers less frequently than the Chargers. Football is confusing. Where the Chargers improved, instead, is on first down. Through the end of November, San Diego allowed opposing offenses an average of 7.2 yards per play on first down. That’s terrifying: The league average is just 5.4 yards per first-down play. They were more than a half-yard worse than the league’s second-worst defense over that time frame (Dallas). A league-high 29.7 percent of plays on first down against the Chargers gained 10 yards or more. But from Week 13 on, the Chargers basically retreated to league average, allowing 5.3 yards per play on first down.7 It was a December miracle. Their success against the Broncos was more notable, though, for what happened on third down. With Denver missing Wes Welker thanks to the first of his two late-season concussions, the Chargers held the Broncos to just two third-down conversions on nine attempts, a 22 percent clip that didn’t match Denver’s season-long output. The Broncos converted 46.8 percent of their third downs this year, the second-best rate in the league. The only team that picked up a higher percentage of its third downs? The San Diego Chargers, with Philip Rivers & Co. moving the chains on 49.0 percent of their third-down tries. The Broncos are also going to get a player back who might help them stop the Chargers on third down. 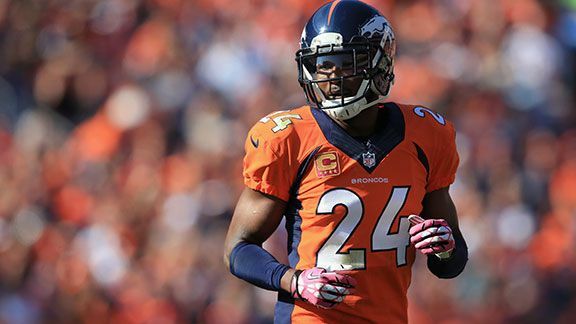 While they won’t have Von Miller, who played in the Week 15 game before suffering a season-ending ACL tear the following week, the Broncos will have Champ Bailey for this Sunday’s game. Bailey returned in Week 16 after missing 11 of the first 14 games of the season with a nagging foot injury, but the Broncos have brought him on slowly since his return, using him as a nickel cornerback off the bench and playing him on less than half of the team’s defensive snaps. The extra week of rest might be enough to push him into the starting lineup, but it remains to be seen whether the future Hall of Famer can suit up at anything resembling his typical level of play. Bailey is not the only player or spot to worry about for Denver on defense. Miller missed the first six games of the year because of suspension before returning and eventually suffering the torn ACL.8 Shaun Phillips is now the team’s primary pass-rusher, but he had just 3.5 sacks over the final eight games of the year. Derek Wolfe, the team’s best defensive lineman, had a “seizure-like episode” on the team bus before Week 13 and hasn’t played since. He returned to practice before Week 17, but hasn’t been practicing this week and appears unlikely to play. 2012 fifth-rounder Malik Jackson has taken most of his reps. Safety Rahim Moore is dealing with compartment syndrome in his leg and won’t be eligible to come off short-term injured reserve until the AFC Championship Game. That leaves safeties Duke Ihenacho and Omar Bolden rotating in and out of the lineup in his place. Jack Del Rio has done a lot to mask as many of the problems on this defense as he can, but there’s just not a lot of talent up and down that side of the roster. In a way, the Broncos are not much different from the Chargers these days: If the Denver defense can do enough to give its offense a chance to win the game, it has done its job. That Chargers defense. If it continues to play at its league-average level, this would essentially be a fair fight, with two league-average defenses and two great offenses. Of course, that undersells Denver’s offense, which has the sixth-best offensive DVOA of the past 25 years, but you get the idea. If the Chargers’ defense is back to its old ways, then it’s a shootout with the best quarterback in the history of football against one of the worst defenses in recent memory. When that matchup happened in Week 10, Manning went 25-of-36 for 330 yards with four touchdowns and no picks. I suspect that the Chargers will try to run the ball to keep Manning on the sideline and hope that they get pressure with exotic pressures, like they did against Dalton and the Bengals a week ago, but I don’t think it will work out quite as well for them this time around. And yes, I was skeptical of the 49ers before that 2012 season, but I wasn’t skeptical that they would be a good team, given that I said they would win the NFC West and go 9-7 but might not be a lock for double-digit wins. In any case, they were better than I suggested in 2012. I asked Grantland colleague Robert Mays about this and he nominated the Seahawks against New Orleans, which is another fair candidate. I watched both of those games within 48 hours this week, and while the Seahawks were incredible, I’m very confident that the Panthers’ performance was better. You can read about what Seattle did to the Saints in Part 1 of the divisional-round preview. That’s using a qualifying minimum of 20 pass attempts. The highest sack rate of the year came when the Lions took down Matt Flynn seven times on 27 dropbacks on Thanksgiving. The 49ers actually got the ball back just before halftime and tried to launch a drive, but Kaepernick eventually took a sack that left the 49ers unable to do very much. That led to one of the most maddening halftime draws of the season; with 30 seconds left on third down and the Panthers out of timeouts, San Francisco ran a draw on third-and-17 from its own 25-yard line. That’s a play with almost no upside, especially against a dominant defense like Carolina, and all downside (the possibility of a turnover or, more plausibly, a holding penalty that would stop the clock and force you to punt to Ted Ginn). C’mon, Jim. I’m not going to call no. 89 naive, but come on, man, he’s Ric Flair! You didn’t think he was going to turn on you eventually? Who are you, Sting? Also, given that Smith mentioned this week that he previously purchased one of Flair’s famous robes and that we’ve never seen Smith wearing a Flair robe before, what is he using it for? Does he wear a Ric Flair robe around the house like it’s his bathrobe? If so, that’s the greatest thing ever. If not, when/where is he using the robe? When/where is it appropriate to wear a Ric Flair robe? SO many questions. Kneeling before halftime on a fifth. Over those final five weeks of the season, Chicago allowed 7.5 yards per first-down attempt, a full yard more than anybody else in the league. Sorry, Mays. You know, the torn ACL he suffered after returning with 16 extra pounds of muscle added to his frame.